Home Mediterranean Cruise A Guide to Taking Your Dream Mediterranean Cruise! A Guide to Taking Your Dream Mediterranean Cruise! A Mediterranean cruise is without doubt the most varied type of cruise available. There are more than 120 seaports around the Mediterranean coastline, offering numerous combinations of cruise vacations over one-week, two-week or longer trips..
A huge clash of cultures await all who opt for a Mediterranean cruise. You can visit no less than 17 different countries, including such nations as Spain, Italy, Greece and Egypt. Each nation has its own unique attractions, all of which you can sample as your cruise ship gracefully sails around the calm blue Mediterranean Sea..
More than 50 companies offer cruises along varied routes in the Mediterranean. Some companies specialize in providing Western Mediterranean cruises, concentrating on ports of call around Portugal, Spain, France, Italy and Morocco. 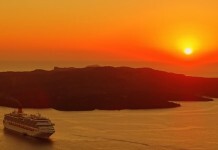 Other companies offer Eastern Mediterranean cruises which take in Croatia, Greece, Turkey and countries in the Middle East..
Popular specialist Mediterranean cruises include a tour of the North African nations, a Mediterranean islands cruise that visits the island nations of Cyprus and Malta, as well as cruises around the Greek Islands. If you’re after a longer vacation, it is possible to arrange a cruise itinerary that takes you around most if not all of the Mediterranean nations..
History, culture, grand cities, ancient monuments, romantic islands and breathtaking views are all within easy reach on a Mediterranean cruise. In the Western Mediterranean you can discover the traditional white Andalucian villages of Southern Spain, sample the world-famous Manzanilla sherry in Cadiz and visit the cultural hub of Europe in the shape of Barcelona, before travelling onwards to the French Riviera..
A cruise that takes in the wonderful coastline of Italy yields such treasures as the dormant volcano of Mt Vesuvius, ancient Pompeii and the stunning city of Rome. The islands of Sicily and Sardinia hold many delights too on a Western Mediterranean cruise.. In the Eastern Mediterranean, cruise passengers can discover the spectacular Croatian coastline and its beautiful city – Dubrovnik, before diving southeastwards to sample classical Greece and its sultry islands. The island of Crete is always worth a visit, if only for the historic Palace of Knossos..
A visit to the holy city of Jerusalem is a worthwhile excursion from both Israeli ports – Haifa and Ashdod – on a Mediterranean cruise of the Middle East. Egypt’s Port Said is well worth a visit too. Port Said provides access to the world famous Suez Canal, which takes vessels into the Red Sea and onwards in to the Arabian Sea.. The Mediterranean region has seen many a civilization rise and fall. It is a crucible of human evolution and is rich in relics left over by more than 6,000 years of occupation. If you’ve ever wanted to discover what it felt like to be an Egyptian pharaoh, Roman warrior or a Greek philosopher, a Mediterranean cruise can give you just that opportunity..
Aussie Cruise Lines has tons of advice on how to plan a cruise and expert tips for first-time cruisers. We've got everything you need to know before your first sailing.